Do you need a hand with your flat pack furniture assembly in Bounds Green N11? Then, you can count on the professionals from Simple Assembly to complete the task for you. The technicians have years of experience in assembling furniture from most popular brands. This means that they are familiar with theassembly instructions for a wide range of different types of furniture from various retailers. Therefore, we always deliver our service in an efficient manner and up to the highest standard, whether it is an IKEA wardrobe, a bed from Argos or a Mamas & Papas cot. 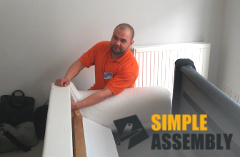 For quick and easy booking on Bounds Green N11 flat pack assembly services call 020 3404 5905 now! We have a team of friendly call centre operators expecting your call around the clock to help you define the right service for your needs and to offer you free quotes. And for those of you who'd rather get in touch and make bookings online, use our live chat or online booking form.